Sokolove Law has recovered over $4.3 Billion for mesothelioma and asbestos-related disease victims and their families. Did you work at an asbestos-related company? Consult our list of known workplaces to see if your company is listed. Certain workers run a higher risk of being exposed to asbestos. See our list to learn if your line of work is one that has a high risk of asbestos exposure. Are you a proud U.S. veteran? Our nation’s heroes also have a long history with asbestos exposure. Learn more about this trend and about what you can do to stop it. Fill out a short 2-minute form to begin your free case review. Our experienced team will review your information and may help you kickstart the legal process. We have recovered over $4.3 Billion for victims and families of mesothelioma and asbestos-related diseases. 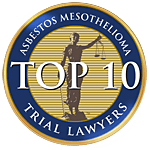 We have handled more than 6,000 mesothelioma and asbestos-related cases for victims nationwide. For more than 40 years, we've successfully fought to get victims and families the justice they deserve. Our firm has helped Americans nationwide recover over $7.4 Billion for many different case types. Our network of attorneys allows us to help victims in any state and maximize potential settlements. Our mission is to provide trusted legal help to people just like you. We have offices across the nation and will travel to you to help you seek compensation. Check out some of our featured TV interviews and commercials from our curated media library. Get unlimited access to the Sokolove Video Library now.